It’s this cook’s favorite time of year, Thanksgiving. 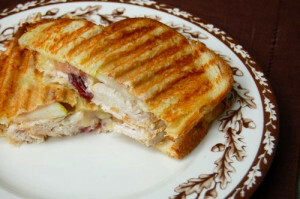 Up until the arrival of this holiday, I will be posting recipe by recipe a complete meal. 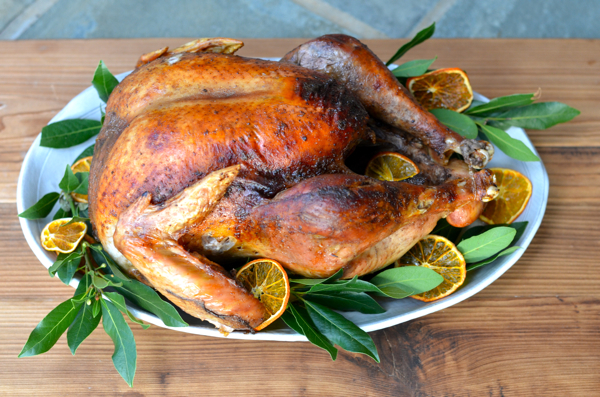 This week’s post is the centerpiece of the holiday, a delicious brined turkey. 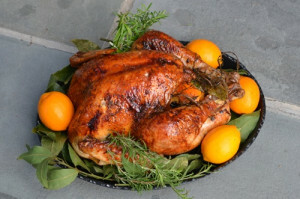 Ever since I started to brine my turkey’s the night before, I have delivered to my table a juicy, moist roasted turkey. 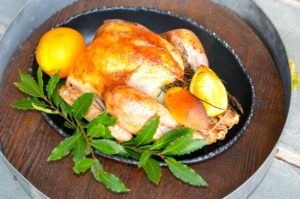 I especially enjoyed this brine, which uses some of my favorite fall flavors – apple cider, apples, maple syrup, cinnamon, sage, brown sugar and a touch of allspice. The flavors combine to create a subtle sweetness to the meat. For the roasting by using maple syrup and melted butter to baste the turkey, the result is a beautiful crisp and brown skin on the outside of the turkey and the inside meat is moist and tender. 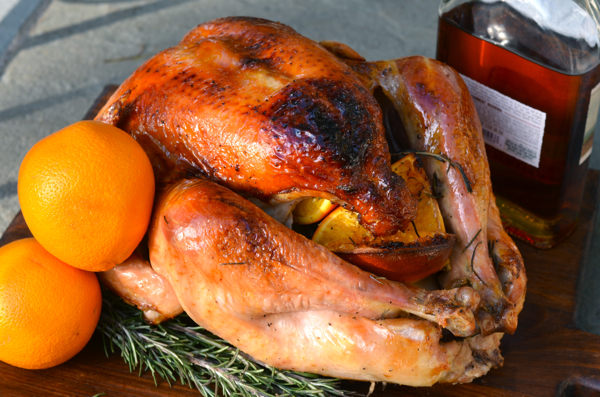 So follow along to create a perfect holiday menu! 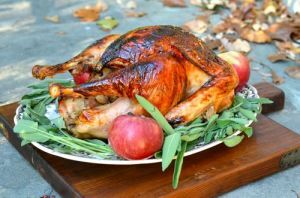 From by the bay wishing you apple cider brined food memories! 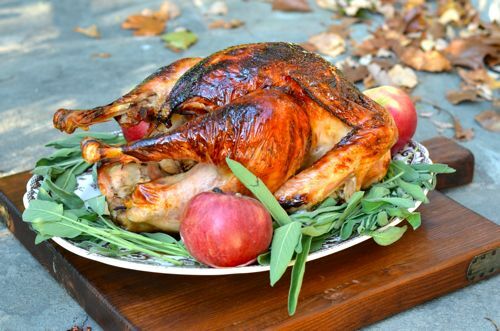 This entry was posted in main dish, poultry and tagged apple recipes, brine recipes, cider recipes, fall foods, fall recipes, maple recipes, roast recipes, Thanksgiving recipes, turkey recipes on May 24, 2014 by entertainingbythebay. Thanksgiving has always been a very special holiday in my family. Our celebrations, always wonderful, still left my sisters and I yearning for the day we could go into Manhattan to watch the Thanksgiving Day parade. When my niece was just 4 years old, we decided this was the year to start going to the parade and that I should prepare the Thanksgiving meal in my city apartment. I was frightened at the thought of cooking this meal. So, I decided to buy a semi prepared meal from a great caterer. The turkey still needed to be cooked in the oven. Unfortunately, I didn’t really think the logistics through. The caterer was in midtown Manhattan and my apartment was in Queens. The caterer was not delivering , it was pick up only. I did not think about the boxes or how big they might be, or what if there was bad weather, or how much space I might need to actually need to cook or heat up the entire meal. So when Thanksgiving morning arrived, it was snowing- hard. In fact, I think it was the most snow I had ever seen for Thanksgiving. My family was coming into Queens from Long Island, we quickly ditched our plan to see the Thanksgiving Day parade. Now we just hoped that the roads would be clear later in the day to travel. I went to the caterer with a friend ( at least I had the presence of mind to not go to the caterer alone) to pick up the meal. It was three enormous cartons of food. We somehow got the boxes out onto the street slipping and sliding in the snow trying to hail a cab. If you are not from New York, let me share with you that cab drivers are not very happy with a fare to Queens, especially in the snow. Finally, I was able to plea with a driver to take me and the boxes to Queens. Naively, I thought the worse part of my day was over. It was just beginning. The directions to complete the meal were long and needed a much bigger kitchen than my little narrow gallery kitchen. I did, finally, manage to complete the meal but not all at the same time. The final vote from the family was the meal was ok, but I could make a much better one on my own. Lesson learned. I have been making the Thanksgiving meal ever since, whether it was in my Manhattan apartment or by the bay. 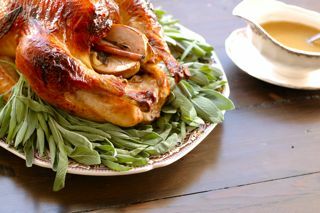 Either way, I want to share my easy recipes for making a successful Thanksgiving meal – starting with my roasted honey herb turkey, always tender because it’s brined the night before! This turkey has big fresh and bright flavor from the lemons and herbs. It’s simple to prepare and delicious and moist. Give it a try! From by the bay, wishing you the happiest Thanksgiving and fond food memories! 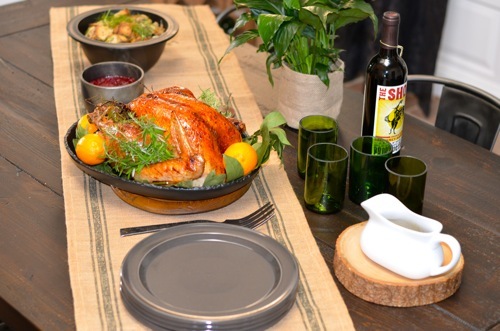 Check in for more Thanksgiving blogs on gravy, side dishes, desserts and leftovers! 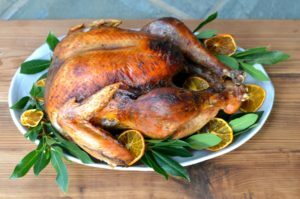 This entry was posted in main dish, poultry and tagged fall foods, fall recipes, family dinners, herb recipes, honey recipes, poultry recipes, Thanksgiving recipes, turkey recipes on May 24, 2014 by entertainingbythebay. I love the holiday season, but with that we are all rushing to get so much done. The days are already filled with work, family and friends. When the holiday season arrives there are the extra activities of shopping for gifts, decorating the house and extra entertaining. 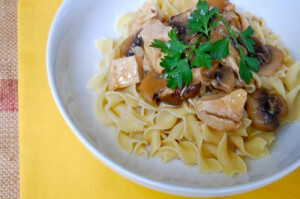 So with that I love when I have a recipe that is easy, simple and delicious. This one pan roast chicken and vegetables is just so easy to assemble and it looks and tastes just amazing. My recipe suggests certain vegetables to surround the chicken, but you can easy use other vegetables if you like such as carrots, asparugus, scallions, cauliflower or sliced peppers and onions. 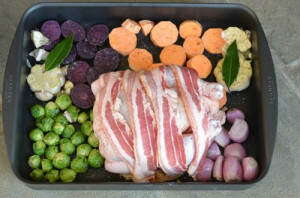 If any of the vegetables seemed to have cooked too quickly, just take them of the pan , cover with foil and put the pan back into the oven to finish roasting. The dish is not only easy to make, it’s all a quick clean up. Especially, if you use a nice non stick pan such as scan pan, it’s about a 1 minute to clean up. So find yourself some extra time for the holiday acitivities with this quick dish.From by the bay wishing you speedy food memories! Preheat oven to 400 degrees F . Drizzle the bottom of the baking pan with olive oil. Place two slices of bread in pan. Bring chicken to room temperature and season with salt and pepper inside the cavity and outside. Place chicken on top of the bread in the baking pan. 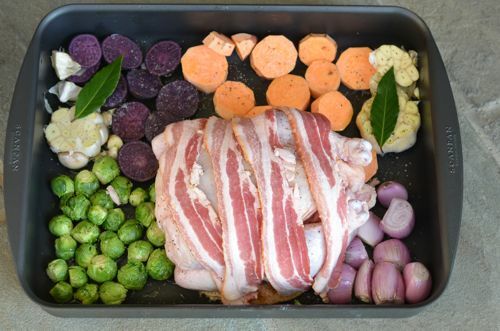 Wrap the chicken with bacon, drizzle with maple syrup and top with butter. Add the remaining vegetables around the chicken. Drizzle with remaining olive oil and season with salt and pepper. 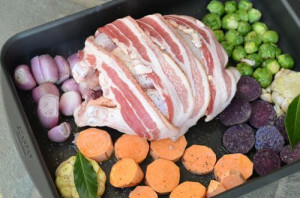 Place in the oven and roast chicken until the bacon is crisp and the chicken is 175 degrees F and the juices run clear, approximately 1 1/2 hours. If the vegetables look dry add a little water or white wine. 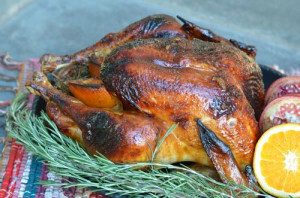 Let chicken rest for at least 15 minutes before carving. Serve with the roasted vegetables and bread from the pan. This entry was posted in main dish, poultry and tagged brussel sprout recipes, chicken recipes, easy recipes, Fall Food, fall recipes, garlic recipes, maple recipes, one pan recipes, roast recipes, sweet potato recipes on December 12, 2013 by entertainingbythebay.